After having canceled his East Coast tour due to pneumonia, Jai Uttal was back strong as ever for the headline spot Saturday night at Shakti Fest. 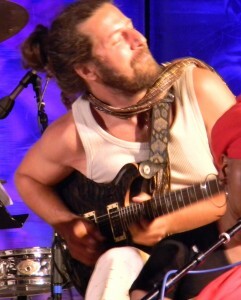 He filled the stage with master musicians — 13 or so, by our count, plus beautiful wife Nubia Teixeira dancing with the deities in the wings — and brought the crowd to its feet for nearly three hours, an exuberant joyride that had even Bhakti Fest founder Sridhar Silberfein, who is rarely seen on stage, dancing with abandon at the back. 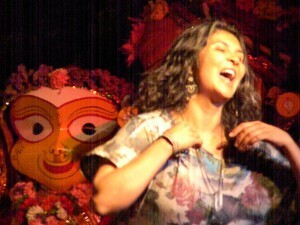 The set was classic Jai Uttal & the Queen of Hearts Orchestra in full-on heart-throbbing raucousness. Long, rolling chants that built to an ecstatic frenzy were punctuated by soaring guitar jams between Uttal, Yehoshua Brill on electric and Mark Gorman on bass, and playful call-and-response drumming between Daniel Paul on tabla and Visvambhar Sheth on mrdanga. Yehoshua Brill. Remember the name. 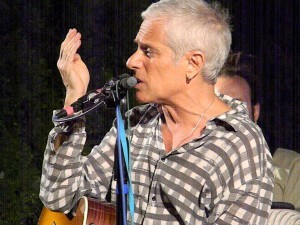 It culminated in a new composition — being played for the first time ever as a group, Uttal said — that wrapped the Beatles mantra “HELP! I need somebody” inside a funky reggae-style Maha Mantra. 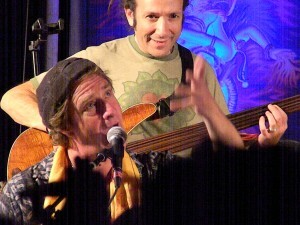 Interspersed through it all were the kind of down-to-earth, open-hearted “Jai-isms” that we love about this kirtan rock star. Like his pointing out that Shakti Fest constituted he and Teixiera’s “first overnight date in seven years” without son Ezra Gopal (who declared to them just prior to the trip that he didn’t want to go, in classic 7-year-old fashion). Good to have you back singing Jai. 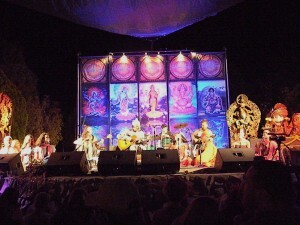 The band (L to R): Rasika (of Kirtaniyas), Shiva Rea, Vrinda and Visvambhar Sheth (of Mayapuris), Bob Wisdom (barely visible), Daniel Paul, Mark Gorman, Jai Uttal, Dave Allen, Prajna Vieirra, Yehoshua Brill, C.C. White, Dhanya and Bali Rico (of Mayapuris). Wonderful post…I loved the video! Looks like everyone had an amazing time! Thanks so much Jessica — glad you enjoyed it all. It was a pretty epic night with Jai. The HELP!/Maha Mantra medley at the end just put us right over the top!